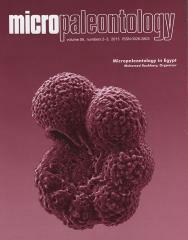 ABSTRACT:Ahigh resolution biostratigraphic analysis of the Pliocene–Pleistocene sequence of the offshoreNile Delta region inWest Delta Deep Marine Concession (WDDM), in which 29 planktonic foraminiferal species belonging to 8 genera and 51 benthic foraminiferal species belonging to 40 genera were identified, allowed the recognition of seven foraminiferal zones and two subzones. These are as follows: Sphaeroidinellopsis Acme Zone (MPl1), Globorotalia margaritae Zone (MPl2), Globorotalia puncticulata / Globorotalia margaritae Zone (MPl3), Sphaeroidinellopsis s.l. Zone (MPl4), Globorotalia puncticulata Subzone (MPl4a), Globorotalia planispira Subzone (MPl4b), Globigerinoides elongatus Zone (MPl5), Globorotalia inflata Zone (MPl6) and Hyalinea balthica Zone.